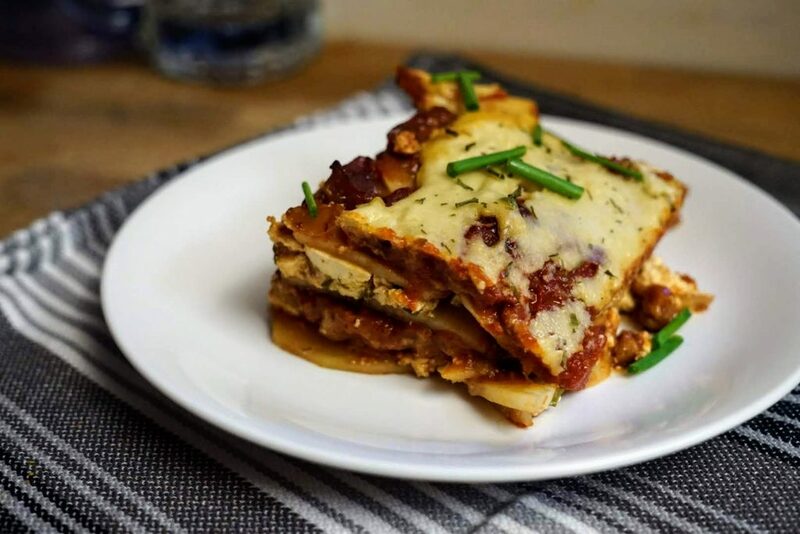 VeganMoFo – Potato Lasagna – vegan in your city. There are a couple of things I’ve been especially looking forward to making this month, and one of those things was a potato lasagna. But not one where it just happens to be an ingredient, but one where the potato is really centred in the dish – where you take slices of potatoes, and pretend they are noodles. Maybe that’s just a potato casserole, but I’m going to call it lasagna anyway. JC once made an incredible rustic bread lasagna from a recipe on Vegan Yum Yum and ever since my lasagna definition has expanded to include zucchini noodles and beyond. Having access to a mandolin makes this dish easier, but you can definitely just thinly slice up potatoes – but the thickness is important because the potatoes have to be around 2.5 mm or less to properly cook through once you’ve got several layers going. We picked up a 10 pound bag of potatoes when we were in Prince Edward Island last month, which I consider the home of excellent Canadian potatoes, and I was excited to use them in this tasty dish. The nice thing is that if you cut up too many slices for your pan size, you can always just mix the potato slices with some garlic salt, oil, and roast on a flat sheet with the lasagna, and everyone is a winner. This lasagna is topped off with Somer McCowans wonderful cashew mozzarella, which you can find on her recipe for individual pizzas – but you could easily replace it with your favourite non-dairy mozzarella if you wanted to. I whipped up a quick and easy vegan ricotta-ish filling just for an additional layer – and it worked really well as well. Everything is really easy, and you can make it your own dish with your own favourite layers. I used a basic combination of tofu ricotta ingredients – tofu, nutritional yeast, chives, lemon juice, olive oil and salt and mashed them together. I basically veganized the recipe available from PEI Potatoes, but skipped the mushrooms because I didn’t have any, and replaced the beef with Yves Ground Round, and did multiple layers alternating potatoes – ground round – potatoes – tofu ricotta. For the “meat” you could also use a lentil bolognese sauce such as the one from Minimalist Baker. 1 batch of your favourite tofu ricotta recipe. I used a simplified version of this one. Add pasta sauce, 1 tbsp of nutritional yeast, and oregano and cook until heated through. arrange the potato slices in a 5L square baking dish, spread with 1/3 of the beefy mix, 1 tbsp of nutritional yeast. repeat until you run out of beefy mixture. bake covered until potatoes are tender, approximately 1h20m, and then top with the moxarella cheeze and bake uncovered for 15 minutes. That looks delicious! I really love the potato layer in moussaka, so I feel sure I would enjoy this too! I love this. Lasagna made with potato must be superior to pasta!